We believe in strong after-sales support. In accordance with this philosophy we have a very strong application support team consisting. All our specialists are qualified and industrially experienced in their respective fields. The Managing Director, Mr. Raymond Ramrajkar has developed and written the entire Color Matching Software. He is now heading a team of qualified software engineers for software development. We have a team of 12 qualified hardware engineers headed by our Director Mr. J. P. Gosar, who himself is a Electronic Engineer. International QC specifications require routine control of testing equipment to ensure accurate measurement results. 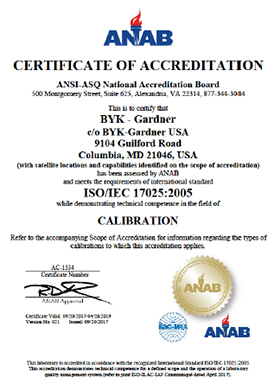 We offer re-certification and calibration service for all BYK-Gardner instruments.